While you don’t have to get leather pants to complete your leather motorcycle gear, it’s never a bad idea to pick up a pair for cold days or dangerous rides. Schott NYC makes a variety of high-quality leather jeans that will both keep you warm during long, cold rides and safe if you were ever to be in an accident. Why buy from Schott NYC? Schott NYC leather motorcycle pants are nearly as old as motorcycles in America. Started in 1913 by the Schott brothers, Schott NYC is still owned and operated by the Schott family, now entering their fourth generation. 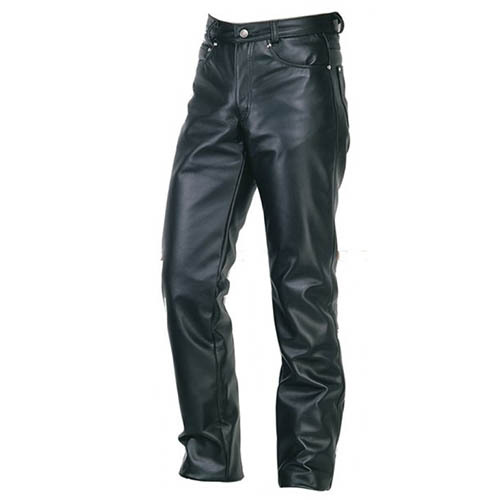 Men’s leather motorcycle pants made by Schott NYC have a unique feature that makes them superior to any other brand of leather pants you could buy. They are designed without a side leg seam, which makes them much more comfortable to wear on long rides. Each leg is its own solid piece of leather. They are more durable and less susceptible to tearing, ripping, or damage, even just through everyday wear. Schott NYC offers both a straight leg and boot-cut design to make finding the perfect pair of men’s leather motorcycle pants easy. These designs are produced by hand and made only from the highest-quality materials and accents for outstanding durability and style.